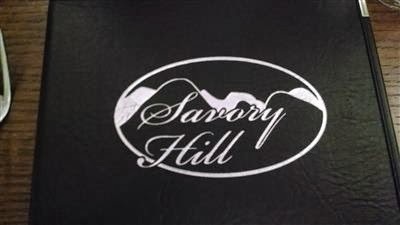 This past Saturday, we decided to try another 'new to us' restaurant: Savory Hill in Moon Township. It turns out it's nearly right across the street from where SP's dad lived when he lived in Moon Township. Before dinner, we did some shopping in the Robinson area and it wasn't until 20 minutes before our reservation, as we were sitting in the Home Depot parking lot, that I realized I had forgotten the camera. Oops. So these photos are courtesy of our cell phones, mostly my cell phone. We were seated right away. There weren't too many people there when we arrived, but within minutes the place started to fill up. The decor is nondescript - not sterile, but not cozy/romantic, but not generic family chain restaurant. 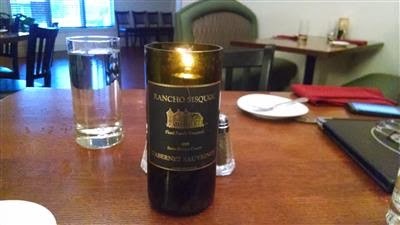 It seemed like a fairly large place, with white walls, lots of light, booths and tables, high ceilings, and wine bottle candles on each table. 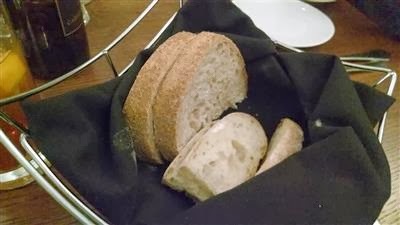 We ordered iced teas and some bread arrived while we looked over the menus. There was a white bread and a light brown bread, which SP thinks was a wheat bread. 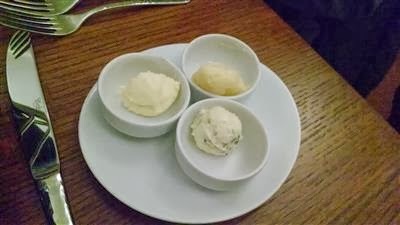 There were three butters: whipped, honey, and garlic, The garlic butter was quite garlicky smelling. I stuck with the honey butter, which was delicious. We both liked it best and finished it! 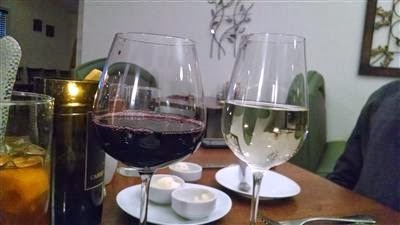 We also each ordered a glass of wine: malbec for me, sauvignon blanc for SP. 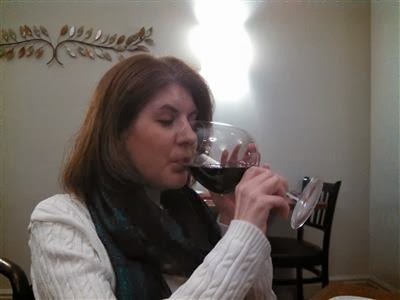 My malbec arrived in a huge glass. It was the largest wine glass I have ever seen. It made me think of Courtney Cox's character on Cougar Town and her huge glass for wine. I had to use two hands because I was afraid of losing my grip and spilling red wine all over my white sweater. SP thought it was funny how huge the glass was next to my face, with me using both hands. 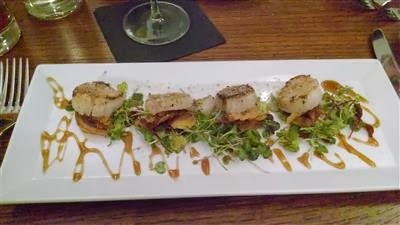 I decided to start with an order of Scallops Napoleon, pan seared scallop, crispy pancetta, asiago lemon bread crumbs, star anise gastrique. I was worried the scallops might be too tough/overcooked because they were thinner than what I am accustomed to receiving. Happily, they weren't, they were nicely seared and seasoned, buttery and smooth, nice rounds of crispy pancetta underneath, fresh microgreens, and a gastrique that I enjoyed much more than I expected since usually I am not a huge fan of star anise flavor. 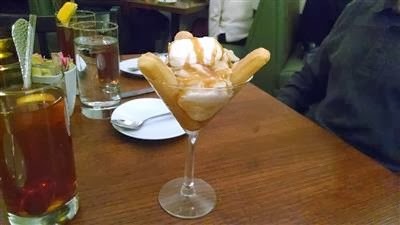 It was deliciously sweet and slightly syrupy but not overpowering. We both mopped up the gastrique with our forks and some bread. 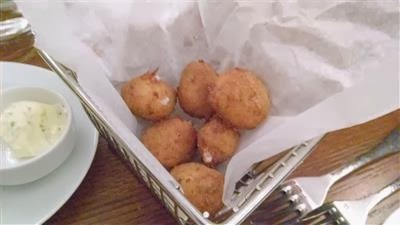 To my surprise, SP started with an order of Bacon Horseradish Bites - deep fried bites of bacon, horseradish and cheddar crusted in breadcrumbs. He liked them a lot, and I did, too. Then again, fried food is yummy and bacon is always yummy! It's an interesting idea, and tasty. I would like to try some of the other flavors of bites. 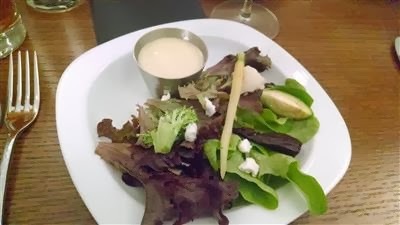 We shared a Chef's Garden Salad, baby lettuces, seasonal vegetable, goat cheese, honey champagne vinaigrette. Our server offered to split it on two plates for us, which was quite nice. A nice mix of crisp greens, blanched broccoli, cauliflower, and Brussels sprout plus pickled beet for the seasonal vegetable, goat cheese, and a creamy dressing. This was nice for a change from the usual dinner salad, having the winter vegetables instead of cucumber and tomato and maybe shredded carrot like at many places. SP really enjoyed the vinaigrette. 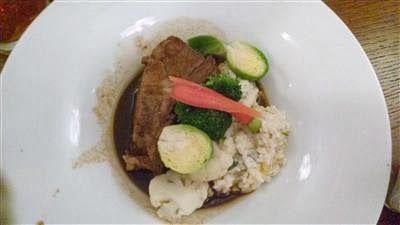 For my entree I opted for Braised Short Rib, seasonal risotto and seasonal vegetable. The seasonal risotto was cauliflower risotto. The seasonal vegetables were the same as on the salad: cauliflower, broccoli, Brussels sprouts, carrot. The risotto was delicious and creamy, but unfortunately, I had neglected to ask about the garlic and this was quite a garlicky risotto. I could taste it as soon as I had one spoonful in my mouth, and then when I leaned down I could smell it. SP verified that it was garlicky. So I didn't eat any more of it because I was afraid of upsetting my stomach. Stupid unpredictable garlic sensitivity. 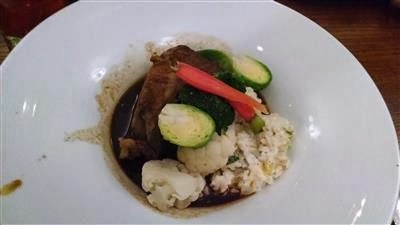 The short rib was very flavorful, but I found it a bit fattier and harder to shred apart with only a fork than braised short ribs I have had at other restaurants. 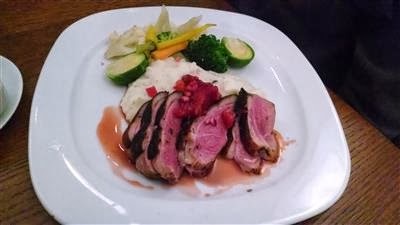 SP ordered the Blood Orange Duck Special, with mashed rosemary potatoes and seasonal vegetables. The duck was medium rare. He said it was delicious but it was a tad rarer than he normally likes for medium rare. That being said, he isn't squeamish about rare foods, so this was fine. I liked his potatoes (since I wasn't eating the risotto I was eating his potatoes). 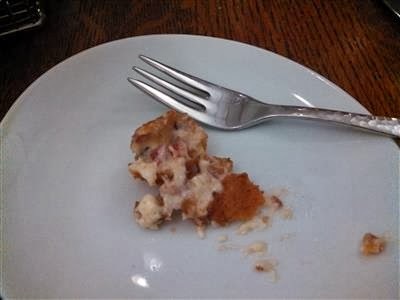 He thought the seasonal vegetables were a tad undercooked, still a little too crisp, and I can see what he means, but I liked them since I don't like limp, soggy vegetables. We had enough room to share a dessert. The Cinnamon Pear Tiramisu won over the Cinnamon Creme Brulee. It was presented differently than I expected but the cinnamon, pear, spice, cream flavors were delicious. I really liked all the soft pear slices - I always forget how much I like pears. 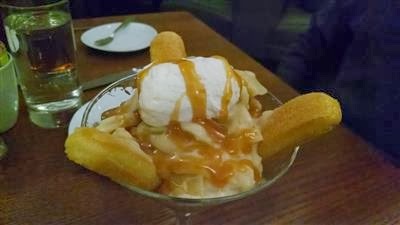 We had no trouble polishing off this dessert! It was just the right size for us to share after everything else we ate. Overall, we very much enjoyed our meal at Savory Hill. Our server was very nice. Iced teas and water were refilled. Plates were cleared after each course and before the next arrived (bread plates left in case we wanted more bread, which we did). It took a bit of time between the salad and entree courses, but we didn't have anywhere to be and we were enjoying a nice, relaxing evening out together, sipping wine, talking about SP's upcoming birthday plans, so even though we noticed, it wasn't an annoying, where the heck is my food kind of thing. I like that a restaurant like this is located so close to us/not in the city. We would go again - and as a bonus, if you're planning on going, keep an eye out for the Clipper Magazines (Robinson) with coupons for local places because we had a coupon for $10 off two dinner entrees, which was nice.